Hastings Online Times – Local projects want your vote! 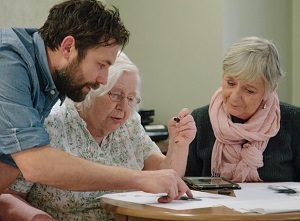 Dementia Drawing group: participants, carers, teachers, family and, in boater, life model. Dementia Drawing and the Hope Project are among five projects shortlisted in the South East region. The three gathering most votes will be declared winners, each earning a life-changing £50,000. So both the Hastings projects could win – but there’s only one vote per region allowed per email address. 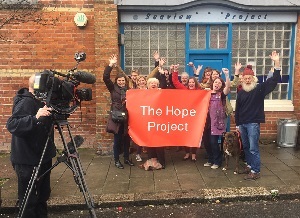 ITV’s local news programme Meridian East will be featuring both projects, Dementia Drawing on Monday 16 April and The Hope Project on Tuesday 17 April, both at 6pm. To place your vote visit the People’s Projects website. Voting opens at 9am on Monday 16 April and closes at midday on Monday 30th. Filming the Hope Project at Seaview. Success in this competition would enable both projects to expand their horizons considerably. Dementia Drawing would have the resources to grow from a small group that holds drawing sessions in just three care homes to become an established organization meeting the need in the dementia community for regular classes for more people, in more places, while the Hope Project would use the grant to work intensively with five groups of people who are either vulnerable or on the margins of society to explore ideas around hope, aspiration and change. The Hope Project A collaboration between Hastings-based artists and aims to enhance wellbeing by combining arts and coaching. Local groups work with their hands to explore their feelings about hope and set goals for the future. It will culminate in a public exhibition presenting a rich picture of life from a range of very different perspectives. Lee Shearman, left, running a workshop for Skeletons Out of the Closet, a project delivered by the Hope Project team (Photo: Mike Laloë). Janey Moffatt, crafter and chief for the Hope Project and known locally for her work with the Jerwood Gallery and for yarn bombing on Hastings Pier, says, “We know how beneficial creative activities can be for people’s mental health, whatever your situation, because of the kind of concentration it takes, but also because it can be an opportunity to work through things and get them off your chest. 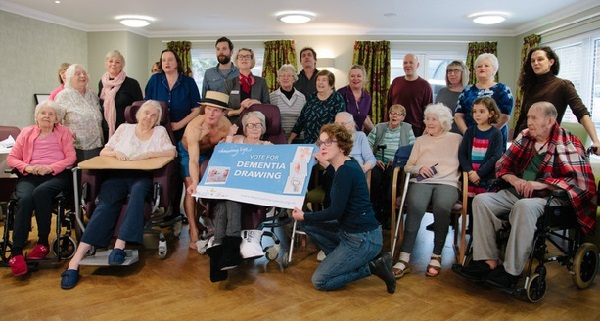 Dementia Drawing “Our classes involve a nearly naked model, an art teacher and a few sticks of charcoal plus some cartridge paper,” says Judy, who is the project director. “There’s always a lovely atmosphere, and sometimes there’s laughter, sometimes song. People draw with a freedom that allows a special kind of vision and creativity. Art tutor Robert Sample, Celia Mortimer and her daughter Julia. 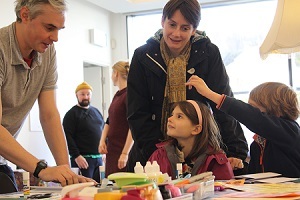 The People’s Projects is a collaboration between the Big Lottery Fund, the National Lottery, ITV and STV. This year, its 13th, it has shortlisted 95 community-based schemes across the UK: the winners, three in each region, will share of pot of £3 million. For enquiries about The Hope Project contact Sophie Shaw at sophie@hocc.org.uk or on 0771 213 7760. For more information on Dementia Drawing contact Judy Parkinson at judy.parkinson@mac.com or on 07768 633755. If you don’t have an email address, you can vote by post – see instructions on the People’s Projects website.